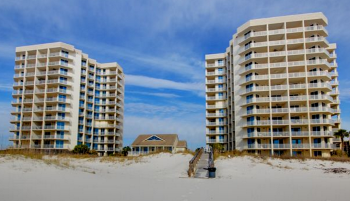 Exceptional gulf-front two-bedroom Beach & Yacht condo for sale in Perdido Key Florida. Ideal resort home for a family that loves outdoor activities such as boating and water-sports. Great views of the Gulf of Mexico from the moment you walk in as well as in the living room and the dining area. Private balcony off living room with wooden slats to allow gentle breezes. There is also access to the balcony from the master bedroom. The second bedroom has access to the north balcony with great views of Old River. Other features include granite counter-tops in the kitchen, wet-bar with granite, central vac system, covered parking. This well-maintained community has tennis courts, pool, a boat-dock, boat storage and on-site management.